← What Did The Children Learn in School Today? After working for five US presidents, Dennis Ross has resigned his position as President Obama’s chief Middle East advisor. Presidents Reagan, Bush I, Clinton, Bush II and Obama, all arrived at the White House determined to recast the nation’s role in finding a permanent peace between Israel and the Palestinians. Sometimes immediately, sometimes later, one man was involved in shaping how the US dealt with peace between Israel and the Palestinians. At first his role was small; but by the time he went to work for Bill Clinton, George W. Bush and Barack Obama, he had became the key player in the process. That man is Dennis Ross, a non-lawyer, who has been called “Israel’s lawyer”, by former State Department official, Aaron David Miller. “Since the Reagan administration, Dennis Ross has played a crucial role in crafting Middle East policies that never served peace, which is today farther away than ever. His efforts, which contributed to the growth in the number of Israeli settlers in the occupied territories from under 200,000 in the 1980s to nearly 600,000 today, were marked by a litany of failures. “Dennis Ross has done more to undermine the rights of Palestinians and set back their struggle for freedom and equality than any other American official”. One senior U.S. diplomat, Ambassador Daniel Kurtzer, who took part in the Clinton-era negotiations, cited a number of anonymous officials who were critical of Ross’s mediation in the 1990s in his book co-authored with Scott Lasensky, entitled “Negotiating Arab- Israeli Peace”. Ross (pictured above) is a political in-fighter, a skill he employed to land his final post in the Obama White House. MJ Rosenberg wrote in January of this year, that President Obama’s special envoy George Mitchell and Obama’s White House adviser Ross, were engaged in a turf war to control Obama’s Middle East policy. Ross won. Ross’ strong ties to Israel now make him indispensable to the administration. Those ties include his previous role as head of the Jewish People Policy Institute, a Jerusalem-based think tank founded by the Jewish Agency for Israel. Think about it.. The lobby considers the guy in charge of US policy toward Israel an “advocate” for Israel, which he is. (Foxman’s honesty is a rare delight). When Ross leaves the White House at the end of this month, he will return to the Washington Institute for Near East Policy, a spin-off agency created by AIPAC. Ross worked with a variety of titles for five US presidents. But wherever he hung his hat, his Zionist loyalties were clearly evident to those he served and shaped, in the media/religious/political leadership bubble that shields American decision makers and decision-shapers, from seeing any Middle East reality except the Zionist version. An Associated Press story from Jerusalem, published in Ha’aretz this week, reports the conclusion of one of Ross’ final tasks for Obama, blocking President Abbas’ path to the Security Council and protecting Obama from having to cast a UN veto. The Palestinians are slated to receive some 200 million dollars in U.S. security assistance after a top House Republican ended her hold on the money. Rep. Ileana Ros-Lehtinen, the chairwoman of the House Foreign Affairs Committee, informed the Obama administration in recent weeks that she no longer would block 50 million dollars in economic support funds for the Palestinian Security Forces and 148 million dollars in other assistance. In separate letters to the State Department and USAID, Ros-Lehtinen cited President Barack Obama certification that the funds were in the national security interests of the United States as well as word that the government of Israel did not object to the assistance. The letters were sent in September and October. Rep. Ros-Lehtinen has the power to block funds that do not answer “yes” to her question: “Is it good for Israel?” The question is narrow. It reflects her limited vision of what is good for America. The Congresswoman put a “hold” on the funds because Palestinian President Mahmoud Abbas had the audacity to secure an overwhelming victory in a vote for Palestinian admission to UNESCO. It is not nice to “fool” Mother Ros Lehtinen. For doing that, Abbas had to be punished. An earlier vote in Congress in the 1990s, had already automatically put into law an automatic blocking of funds to any UN agency that grants membership to a Palestinian “entity”. Once UNESCO embraced the Palestinians, the money stopped. That 1990s vote comes under the heading of “AIPAC’s long-range planning”. President Obama asked Ros-Lehtinen to lift the block on the funds she was holding back. Obama, Ross or another underling, explained to the Congresswoman what she already knew, there was another important vote on Palestinian membership coming up in the Security Council. Obama spent considerable US chips to make sure that President Abbas would not be able to win that Security Council vote. Abbas needed nine votes to force an inevitable US veto. He had a good reason to believe he might find that total. The Security Council voted 14 to 1 earlier this year on a resolution condemning Israel’s settlement building expansion , requiring that single voter, the US, to cast its veto. The word went out from Washington to the Security Council members that Obama does not want to have to cast another veto. Another message had to be conveyed to Ros Lehtinen to sweeten the deal with wavering members on the Security Council. The message: Let the money go. The President assured Ros-Lehtinen, so says the AP story , that she could sell this sudden change of heart as dollars well spent because it is “in the national security interests of the United States”. The Congresswoman most likely had another question, the one that must always be asked when the US takes any action that affects the State of Israel: “Do we have Netanyahu’s blessing?” The answer came back, yes we do. With this much pressure on the Security Council members, President Abbas realized he could not get his nine votes in the Security Council. He decided to shift his strategy to securing an upgrade to an observer “non-member state”, the same status currently held by the Vatican. This would not be “full membership” but implicitly, it would recognize Palestine as a state. Without the work of Dennis Ross and his colleagues during five US presidential administrations, Israel, AIPAC and the Israel Lobby, might still be struggling to solidify Israel’s total control over Washington. Dennis Ross performed his task well. Ross’s departure is not a diplomatic problem for the White House; it is instead a problem for the Obama re-election campaign. For Ross was the only official in whom most American Jewish leaders had confidence. As most of them are Democrats who have long accepted Ross’s faith in the “peace process,” they viewed his role as the assurance that a steady, experienced, pro-Israel hand was on or near the tiller. When the White House did something that clearly harmed U.S.-Israel relations (such as the recent Sarkozy-Obama exchange on how difficult it is to deal with Prime Minister Netanyahu, where Sarkozy called Netanyahu a liar and Obama appeared to agree), or made foolish demands of Israel (such as the 100 percent construction freeze), and when the tone of the relationship clearly became far worse than it had been under Clinton or Bush, Jewish leaders comforted themselves that Dennis was still there. Abrams previously served in the administrations of two Republican presidents, Ronald Reagan and George Bush II. Unlike Ross, who crossed party lines in his diplomatic posts, Abrams is a staunch Republican. Should President Obama lose in 2012, Abrams would be an early favorite for a position under the next Republican president, none of whom have any expertise in Middle East affairs. During the Reagan administration, Abrams gained notoriety for his involvement in controversial foreign policy decisions regarding Nicaragua and El Salvador. During Bush’s first term, he served as Special Assistant to the President and Senior Director on the National Security Council for Near East and North African Affairs. At the start of Bush’s second term, Abrams was promoted to be his Deputy National Security Advisor for Global Democracy Strategy, in charge of promoting Bush’s strategy of advancing democracy abroad. His appointment by Bush was controversial due to his conviction in 1991 on two misdemeanor counts of unlawfully withholding information from Congress during the Iran-Contra Affair investigation. Abrams’ fingerprints are all over the Hamas-Fatah conflict, as David Rose explains in an April, 2008 essay he wrote for Vanity Fair. With confidential documents, corroborated by outraged former and current U.S. officials, the author reveals how President Bush, Condoleezza Rice, and Deputy National-Security Adviser Elliott Abrams backed an armed force under Fatah strongman Muhammad Dahlan, touching off a bloody civil war in Gaza and leaving Hamas stronger than ever. 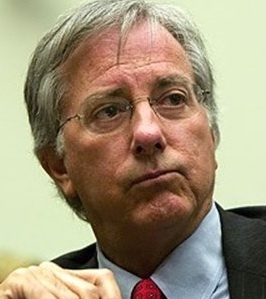 George Bush II’s Deputy National Security Adviser would like nothing better than to see Dennis Ross’ departure from the Obama White House open the way for a new Republican president in 2012. Where does this saga of negotiations delayed while Israel expands in land holdings, leave us? I suggest it leaves us in John Steinbeck country. Steinbeck understood what power does to the powerful. He wrote his classic 1939 American Depression novel, The Grapes of Wrath, after making a trip to the Dust Bowl. He was shocked by the poverty and suffering he saw there. Steinbeck wrote furiously, and in anger. He gave himself 100 days to finish the book. And the great owners, who must lose their land in an upheaval, the great owners with access to history, with eyes to read history and to know the great fact: when property accumulates in too few hands it is taken away. And that companion fact: when a majority of the people are hungry and cold they will take by force what they need. And the little screaming fact that sounds through all history: repression works only to strengthen and knit the repressed. The great owners ignored the three cries of history. The land fell into fewer hands, the number of dispossessed increased, and every effort of the great owners was directed at repression. That sounds a great deal like Occupied Territories, in Palestine, and on the Wall Streets of the world. The picture of Dennis Ross is from the Ma’an News Agency. 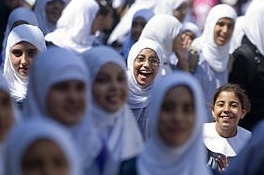 The girls leaving an UNRWA school above, are in Gaza. They are not celebrating Ross’ resignation. They are just happy to be in the sunshine. Of course, every morning they are happy to have arrived safely at school. This entry was posted in Middle East Politics, Netanyahu, Obama, Politics and Elections, The Human Condition. Bookmark the permalink. Yet another spot-on analysis! Thanks, Jim. Now would be a good time for the Democrats to start being the moderate adults in the room working for U.S. interests, instead of Israel “melitz yoshers,” as Abe Foxman so eloquently calls them. Of course everybody wants that AIPAC money, so the Democrats will probably continue service their John. Whatever we may think of Assad at this point, this is a discerning statement: Ross represents the worst of American diplomacy – “we are here to tell you what we want you to do.” Given that the state of Israel was created by an international body that rarely sought or gave credence to Arab opinion, this is a stance that is simply not tenable if we are, indeed, interested in promoting peace with justice. The only hope now is that a very un-Ross like figure will replace him. Hopefully Ross’s resignation is good news for Peace. And we can only hope that his replacement will not be any worse! If the scuttlebutt is correct, Ross may have left after the IAEA report turned out to be based on the still bogus evidence from the “computers.” What his role in “inspiring” the report may be is left to be determined. See the Moon of Alabama blog (http://www.moonofalabama.org/ )to get the information on the so-called atomic weapons engineer from the Ukraine, Danilenko, and the general context of the report. Good reporting and analysis. Turns out the guy is an expert on making nano-diamonds for industrial use, not nuclear weapons. The lies and the distortions pile up. The head of the IAEA appears to be another troll for US dipomacy. –While it’s clearly good riddance to Ross, he will nonetheless move through the revolving door back into Zionist thinktankdom (I understand that Ross was one of the founders of WINEP in the mid-80s…he started young) and continue seamlessly to work mischief, pumping out screeds influencing every U.S. policy on the Palestine-Israel track. Ross is one of a long line of Zionist neocons in-out or out-in of our government (sic): Perle, Wolfowitz, Frum, Libby, Feith, the con Abrams, etc. Here are three of the most dangerous, because they wield direct financial clout: Matthew Levitt, the Zionist who came out of WINEP to stand up Treasury’s first Assistant Secretaryship for pursuing “financial terrorism” after 9-11. Levitt exited in perhaps 2006 for Zionist Stuart Levey, who toiled endlessly to strangle Palestine (primarily Hamas), Lebanon (primarily Hezbollah), Syria, Iran, and anyone or any entity that didn’t walk like or look like a Zionist. Levey traveled regularly on our dime to Zionist Israel for briefings, consultations, and ego boosts (also Europe, where he whipped the EU and vassal states to hew to USrael Ziodoctrine). Levey (who was a carryover from Bush II to Obama) then exited this year for a “new” Zionist, one David Cohen, whom I saw on C-SPAN recently: Cohen dutifully and resolutely thrashed Iran before a Senate finance/budget committee whose members were mesmerized by him as they lusted for Iran’s very lifeblood. –This is only speculation, but I wonder if Ross’ departure is not related to a report I read about a month ago wherein the Palestinian Authority acquired the backbone to denounce Ross’ continuous flacking for Zionist Israel, consigned him to persona non grata status, and vowed never again to receive him. I believe that the despicable Tony Blair was similarly labeled, and I would be elated to learn that Bliar has found it necessary to leave the post he used so Ziocentrically in service of the Quartet and Israel…. Jim, important background on Dennis Ross’ emergence from, advocacy for, and return to AIPAC-related commitments. Not even the thinnest veil, yet the “mainstream” press has consistently referred to him as a “peace envoy”. Your appropriate inclusion of Elliot Abrams’ comments suggests a political situation akin to that when Joe Lieberman “crossed over” to punish the Democrats and leverage his Zionist muscle with both parties. We can be sure that Dennis will still be working hard. Having inadvertently acknowledged Netanyahu as a liar, President Obama has yet another opportunity to stand up to the lies themselves. All he has to do is stick with “national interest”! The real story behind the failure of the Camp David, and the deficiencies of Dennis Ross, lie in negotiations in the summer of 2000 as told by Jesuit priest and longtime peace activist Raymond G. Helmick in his book, Why Camp David Failed? Helmick, who maintained communication with all parties throughout the negotiations, scores Ross’ failure to accord value to international law and willingness to “give” to the Palestinians what was not Iarael’s to give…. Thank you Jim for an excellent piece as usual. I should think it is high time. But then for us in Palestine there has never been a good option. It has always been a bad option or a worse one, so I suppose he can retire in peace. Jim, Thank you for the eloquent and well-supported case exposing to what extent Dennis Ross has been a “Chief Manipulator” of extracting Israeli occupation demands from the toothless mouth of US national interests. Add to that the likes of Congresswoman Ros-Lehtenin, and our Kanessetized-Congress, and we are left with virtually no one that prioritizes US interests, when it comes to Israel’s. It is obvious that AIPAC has an entire gang of serial-manipulators that it sends out to penetrate the White House and Congress. Even, “Godfather of Manipulators”, Henry Kissinger, sits back as Presidents Bush II and Obama seek him out to listen to his German-accented “Final solutions” of Palestine, Palestinian identity, and Palestinian homeland. AIPAC has achieved the darkest of all accomplishments on behalf of Israel. But, even in these darkest hours, the Palestinian people will continue to smile, as the Palestinian sun shines on their people, and as the soil deep in their lands cries out for their freedom and rejects the alien settlers of their sacred Homeland. It’s time to face up to the cold hard fact that we have a fifth column in charge of US mideast policy. The people in charge of our policies put Israel’s interests ahead of our own. Our mideast policy takes its marching orders from AIPAC and other Israel Lobbyists, who take there instructions from Israel. Netenyahu has even boasted about this. If AIPAC were classified as an agent of a foreing government, which it is, it would have some restrictions placed on its fund raising ability. Our government is a puppet of Israel when it comes to mideast policy, because of the fifth column in charge in the various administrations and in Congress. It is a national disgrace. It is difficult for a President to make the right decision when his only advisors in the field are strongly committed to one side. Is someone presenting names to President Obama of well qualified replacements for Mr. Ross with a more balanced understanding of the situation? It does seem, to this “outside the loop” observor, who happens to be a Democrat, that he should be able to serve our National Interest better the next time around. I think the assessment of “greasing the wheels” is the most accurate. It has always been in Israel’s interest to keep the American political system in her back pocket. People like Ross, while not necessarily placed in such a position by Israel, certainly have their blessing and support. And that’s the rub here – as almost certainly the Israeli lobby is working overtime to ensure that his replacement is Ross-like. provides a lot of information about Dennis Ross. Among several other sources, the author draws upon “The Truth about Camp David: The Untold Story about the Collapse of the Middle East Peace Process,” by Clayton Swisher.